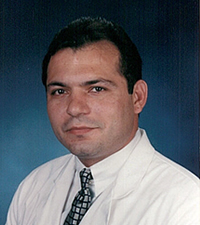 Dr. Dimitrios Mantzoros was born in a village outside of Patra, Greece. He lived in Greece until he was 10 years old. His parents moved the family to Chicago in 1970. He has one brother, Bob, who still resides in Chicago. His parents have since returned to their home in Greece. Dr. Mantzoros attended Sullivan High School in Chicago. His sports activities included boxing and football, highlighted by a football championship that was played and won at Soldiers Field. After high school, he attended Loyola University in Chicago. During his senior year he transferred to the University of Illinois at Champaine/Urbana, maintaining a pre-med biology major. He returned to Chicago and attended Dr. William Scholl College of Podiatric Medicine and graduated in 1988 with a Bachelor of Science and a Doctor of Podiatric Medicine degree. During his medical school externships, he worked at Martin Army Hospital, Ft. Benning, GA; Westside VA Hospital, Chicago, IL; Cook County Hospital, Chicago, IL; Marion VA Hospital, Marion, IN; and St. Michael's Medical Center, Newark NJ. After graduation from Podiatry College, he moved to Conroe, TX to participate in a one year preceptorship under the guidance of Chester Rossi, DPM. Upon completing the preceptorship, he bought Dr. Rossi's practice and settled into life in Conroe. In 1994 he moved the office of Conroe Foot Specialists to 615 Longmire Road and in 1995 opened a satellite office at 284 IH 45 in Huntsville. He attained board certification in 1994. During the last five years he has been a Clinical Assistant Professor for the University of Texas Medical Branch which allows residents to rotate through his office for specialized training. Upon request he speaks and lectures to private groups. Currently he is a member of the Fellow American College of Foot and Ankle Surgeons, The Texas Podiatric Medical Association (TPMA), and the American Podiatric Medical Association (APMA). He is a father of two children, Spiros and Nikos. Currently he spends his free time traveling, diving, boating, and attending his children's sports activities. He returns to Greece annually to visit his homeland and his extended family which still remain there.